HandUp is a charitable giving platform that provides nonprofits and individual donors with a direct and simple way to make an impact on poverty, through innovative giving tools like Member Profiles, Campaigns, and General Funds. Starting November 1st, 2017, South Oakland Shelter (SOS) officially took ownership of HandUp and keeps its products accessible to nonprofits across the Bay Area and the country. This is an exciting milestone as it means the HandUp platform will continue to live on for years to come. To learn more about the transition, check out our Announcement blog post. HandUp originally started in San Francisco in August 2013 as a response to the homelessness crisis in the city. At the time, founders Rose Broome, Zac Witte, and Sammie Rayner wanted to use their backgrounds in technology and community work to make it easier for individuals to give to their homeless neighbors. Initially running HandUp as a side project, they quickly saw the need for their product not only in San Francisco, but across the country. In 2014, HandUp launched their first partnership outside the Bay Area with South Oakland Shelter (SOS) in Metro Detroit, Michigan. Very quickly SOS became one of HandUp’s most active partners. After three years of working closely together, the HandUp platform was acquired by SOS who maintains all the HandUp systems and tools today. Who designed the HandUp logo? The HandUp logo was designed by Nate Kerksick. What is a HandUp Partner? HandUp works with some of the most well-respected homeless service organizations in the nation. Our partners sign members up and then help them redeem their HandUp donations for basic needs like clothing, shelter and medical care. They also connect HandUp members to other resources to help them get ahead. You can learn more about our HandUp Partners on our Partner page. Is HandUp free for partners? Member Profiles: Profiles for individuals experiencing poverty are free of charge. We cover our operating expenses by asking donors for an optional tip. Campaigns: Standard fundraising Campaigns on HandUp are free to nonprofits, however, an 8% fee is charged to donors on top of each donation. 3% of this fee covers credit card processing and the remaining 5% covers HandUp’s costs of operation. Nonprofits may also opt to pay a monthly fee for additional support services. More information can be found on our For Nonprofits page. Who do I contact if I’m interested in becoming a partner? If you’re interested in becoming a HandUp partner, please visit our For Nonprofits page to learn more and sign up. You can also email us at info@handup.org if you have further questions. What are all of the ways that I can donate? Donating directly to our HandUp Members or HandUp Campaigns is the best way to make a direct impact. If, however, you can’t decide on a specific member or campaign, you can donate to our Regional or National Funds and we’ll make sure to distribute your gift to our members who are in the greatest need. If your company uses Gusto, you can also donate to HandUp through their ‘Giving’ feature. If you’d like to mail us a check, please contact us at info@handup.org for more information. Does 100% of my donation REALLY go to the person I chose? Yes! 100% of your donation through handup.org goes directly to the person you choose HandUp covers our operations expenses separately. We even cover the credit card processing fees so that every cent of your donation directly funds the member’s basic needs. We give donors the choice to contribute to HandUp's operations, and most donors do, but this is optional. If you are donating to a general campaign for a nonprofit, however, there is a standard 8% fee. How does my donation get to the person I’m trying to help? Money raised on HandUp is transferred to the appropriate partner organization for use towards their HandUp members’ needs. Members with a cell phone or email access will receive a text and/or email notification of your donation (along with any words of support that you might send). They work with the partner organization’s staff to redeem donations for the specific item or service that they need. For example, staff may work with members to order winter boots through Amazon.com, pay phone bills online, or send a check for a security deposit. Donations are never given directly to HandUp members. How do you make sure that my donation goes towards the member’s stated goals? We rely on our trusted staff at our partner organizations to work with members to use money raised to fulfill goals and specific needs. Case managers and staff are in charge of fulfillment to ensure the member is using the funds responsibly. The partner staff is required to track all purchases using HandUp’s internal accounting system so every cent of your donation is accounted for. What happens to donations for members who become inactive? If a member becomes inactive for an extended amount of time, any funds in that members account are transferred to their organizations general fund and re-distributed to other HandUp members in need. Before we deem a member inactive, we do reach out to them and their case managers to attempt to re-engage the member. If we do not get any response after multiple attempts, then we proceed with transferring the funds to the general fund so that others can benefit from your generous donations. Are HandUp donations tax deductible? Any donation made to a campaign, partner fund, or directly to an individual on HandUp is tax deductible. You will receive an email receipt with your online donation. HandUp also accepts larger program and grant funding. Contact info@handup.org for more info. I got a HandUp coupon - how do I use it? It's easy! Just browse our members and find someone you'd like to donate to. At checkout enter in the Gift Code and the specified amount on the coupon will be applied towards your total. If you cannot decide who to donate to you can also donate to the National Fund or regional funds such as the San Francisco Fund and the Detroit Fund. 100% of your donation to either of these funds will be distributed directly to an existing HandUp member in need. We use Stripe to process all payments and store your credit card information. In fact, that sensitive data goes straight to them and never touches our servers. More information is available here. When I donate to a member, do they know who I am? Only your first name is publicly associated with your donation unless you check the "Donate Anonymously" box when making a donation. When you reply to a member update your first name is always shared. Your other personal data including last name, email, and phone are kept strictly private. How does HandUp handle member privacy? The privacy and dignity of our members is extremely important to us. Our Partners are responsible for ensuring that every member understands HandUp, explicitly wishes to participate in the program, and is presented in a dignified light. Members with privacy concerns are given the option to create a profile under a pseudonym and/or use an alternate image in place of their picture. How does HandUp fund its day-to-day operations? HandUp is sustained through donations from foundations, individual supporters, and fees added on top of donations through the website. For our Member Profiles, 100% of donation directly fund the basic needs of the person you choose. We let donors opt-in a support fee to contribute to the company's operations and growth, and over 80% of donors choose to do so. For Campaigns, HandUp charges a standard 8% on top of each donation. We also get support from corporate partners and foundations. Can HandUp accept grant funding? Yes. HandUp can accept grant funding for certain projects through our fiscal sponsor the Netroots Foundation. Contact info@handup.org for more info. Why do we need HandUp? While crowdfunding has become a popular way for so many to support their creative projects, we wanted to make the power of this model available to all. HandUp empowers people in need to ask for help in a dignified way and creates a compassionate network of support around them. We enable our members to reach their goals, one donation, or encouraging word, at a time. How does HandUp measure its social impact? HandUp focuses on two key indicators to measure impact: funds distributed and total needs met through our system. These new financial resources empower HandUp members to meet their most pressing needs, while also connecting them with other human services through world-class nonprofit partners. Along with a valuable social safety net of caring donors, these factors lead to lasting social impact. Visit our partner pages to see the number of people helped and needs met by each Partner organization. How does HandUp create change? Currently, within our social support programs important items fall through the cracks, like cellphones and security deposits for housing. HandUp bridges these gaps by creating a direct way to deliver resources to those who need them most. Additionally, HandUp is an engaging tool for social service organizations. When members connect with our partner organizations to access to their donations, they are connected to other vital services. They are also connected with a community of donors, creating a vital social support network. How do members sign up? Members learn about, and sign up for, HandUp through our partner organizations. In most cases, partners have existing relationships with our members and can help them set fundraising goals that will have the most direct impact in their lives. How do members redeem their donations? HandUp members redeem their donations with the help of our trusted community partner organizations. Staff of these organizations assist members in purchasing items they’ve listed on their HandUp page, and also connect them to a variety of other services available. I love what you’re doing. How can I get involved? Thanks for your interest! We appreciate your support! Spread the word! Tell your friends, and share HandUp on Facebook or Twitter. How do I get HandUp in my city? Thanks for your interest! Please send us a note and let us know where you are, along with some suggestions of any local non-profits who are making big impacts in the homeless community in your city! If you represent a nonprofit organization that you think might be a fit to partner with HandUp, please visit our For Nonprofits page page. See how Detroit, Michigan started their community HandUp Detroit Collaborative in this case study. Have other questions or comments? Is my donation to a campaign tax deductible? Yes! Donations made to HandUp Campaigns are tax deductible because HandUp only works with organizations that are 501c3 certified nonprofits or are fiscally sponsored by a 501c3 certified nonprofits. Once you have donated to a HandUp Campaign, you will be emailed a receipt with your donation and tax information. What can the organization use the funds for? The organization can use the funds for anything related to the needs of carrying out the goal stated on the campaign. How can my organization start a HandUp Campaign? If you work for a 501c3 certified nonprofit based in the U.S. or an organization based in the U.S. that is fiscally sponsored by a 501c3 certified nonprofits, you can start a HandUp Campaign by visiting our For Nonprofits page. What is a HandUp Gift Card? 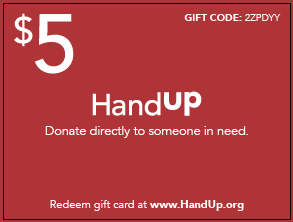 Handup Gift Cards is a program that used to run in San Francisco where donors could purchase gift cards through the HandUp website to be given to someone experiencing homelessness instead of giving cash. This program is currently on hold. How did HandUp Gift Cards work? Once donors purchased the cards, they were mailed to their shipping address. The cards could then be given to someone in need on the street. That person took the card to our non-profit community partner and exchange it for various items such as clothes, food, or other basic necessities. With the transition of the HandUp platform to its new owner in Detroit, South Oakland Shelter, the HandUp Gift Card program had to be put on hold as logistics of operating the program would be very difficult from another city. We are working to find new ways to operate the program and will update our donor community if we’re able to bring the program back.